„A girl likes to be crossed a little in love now and then. It is something to think of.“ And enigmatic Mr. Darcy is the guy, who will be certainly happy to help with that. A classic story from pen of Jane Austen comes alive in the book, on stage of the theater and now also on our table. 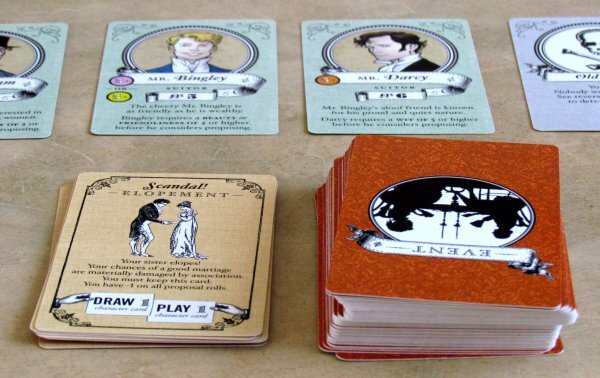 A box titled Marrying Mr. Darcy found us a little unexpectedly, but it immediately caught our attention, because its subtitled The Pride & Prejudice Card Game. It is clear from this, that it takes its theme from the original book and hence great film from director Joe Wright. Character drawings in the game are work of Erik Evensen, while the game itself was designed and created by Erika Svanoe. This lady asked fans of the book to help with release on the Kickstarter server. Campaign ended in October 2013 and we hold review copy only in eight months since then. Nice. Game has multiplied required ten thousand dollars almost six times and picked nearly magical $ 57,774 from a whopping 1,679 fans! Certainly an impressive performance for such a small card game. It most certailny owes part of its success to famous theme and really pretty artwork. Now let’s see, if it can live up to our expectations. 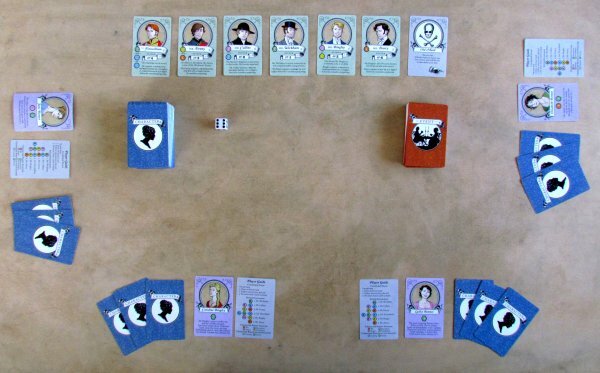 Light blue box from hard glossy cardboard greets us with a portrait of two title characters and ribbon, that winds around them with pictures of other heroes from the novel. Inside, there are three compartments for cards and small space for one six-sided dice. The biggest pile of hundred cards features blue background and provides heroines with opportunity to improve their appearance or character. On the other hand, sixty events catches girls in many different situations and surprises players even with obligation to throw away some cards. Most important among cards are heroines and their suitors. 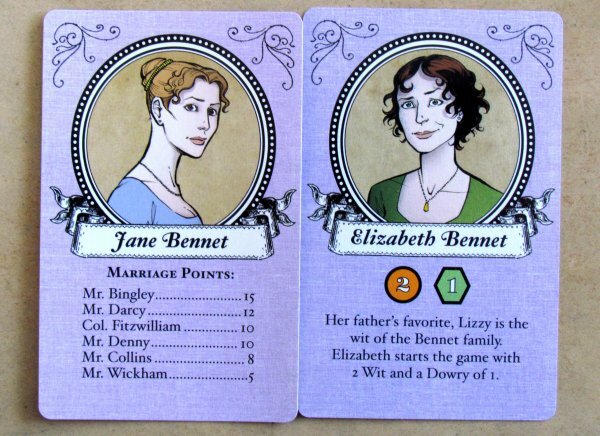 Each character has a card with portrait, name, brief characteristic and traits to begin game with (for example Jane Bennet has two points, one point of beauty and second for talent). Essential things to find are unexpectedly also on the other side of the card, where are secret desires of each heroine. Marriage to each of the suitors has a different value for each of them. Also suitors have a name, picture and number. More fundamentally, however, there is required level of girls character values, which this gentleman puts emphasis on. Without this level, he will never propose this girl to marry him. 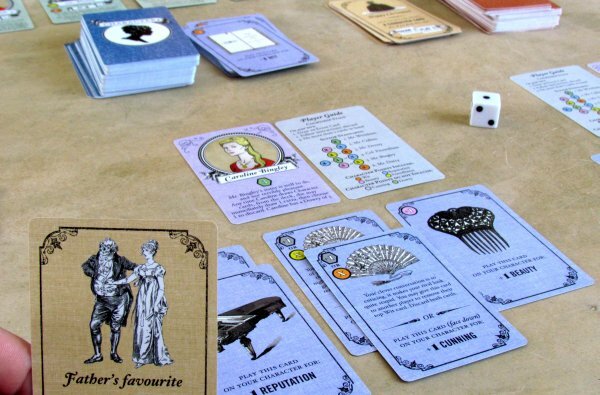 Players spread all six suitors on the table side by side and even add an unpleasant old spinster card. 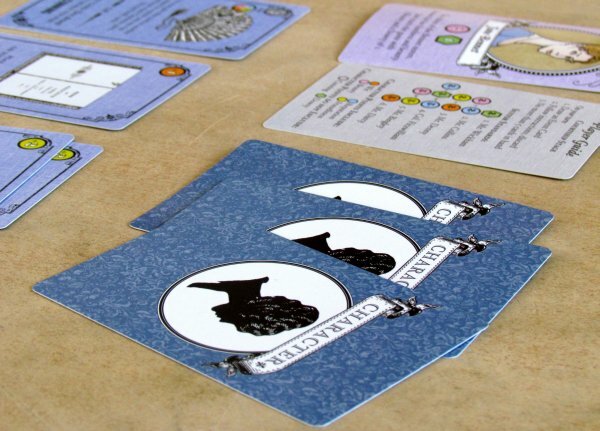 Character and event cards are shuffled and create two separate piles. 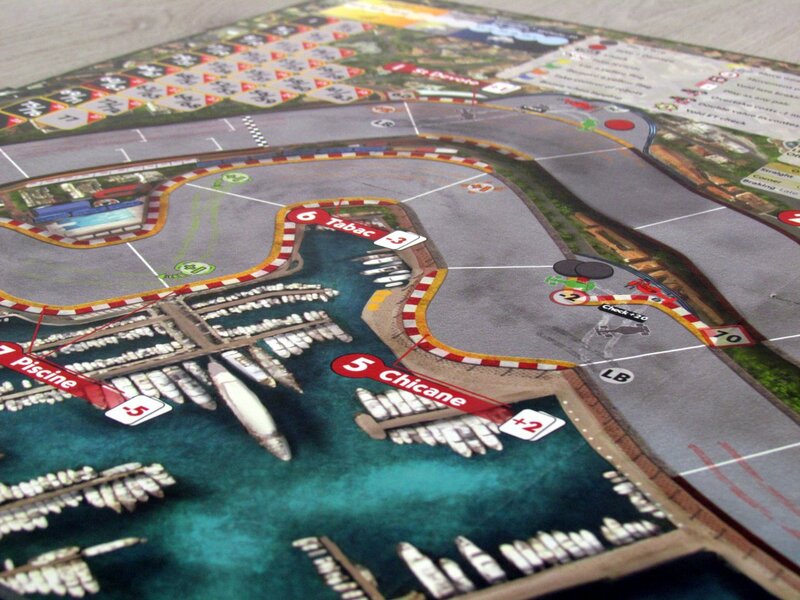 Depending on the number of players in the game, it is necessary to adequately reduce number of event cards to make the game not too long. 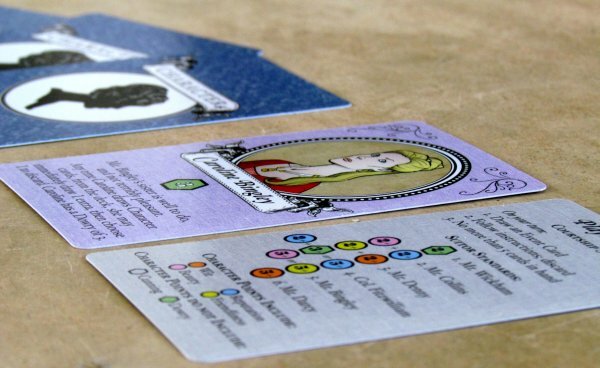 Each of the participants will get three random character cards to start with, but mainly chooses one female character. Order of the selection is decided by a dice roll. Help cards will assist players with all informations needed and everyone, who participates in the game, gets one. 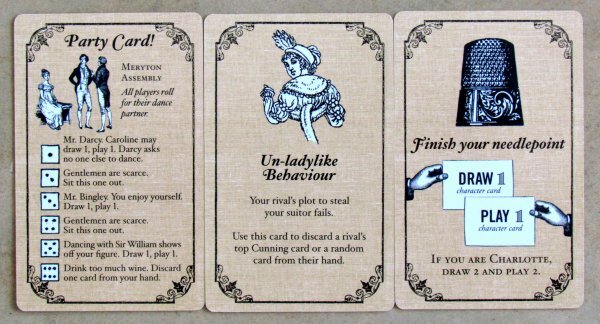 Players then take turns in attempts to improve their heroine, and obtain hand of her dreamed suitor. 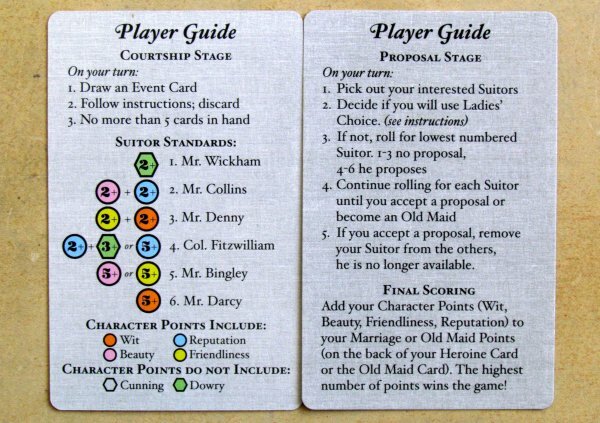 Each turn begins by drawing one event card, whose instructions must be followed not only by active heroine, but by all characters in the game. This is followed by drawing one character card from the deck. Player then takes this card into her hand and has a chance to play any of those cards. She lays it out in front of her face up and improves statistics of her heroine. 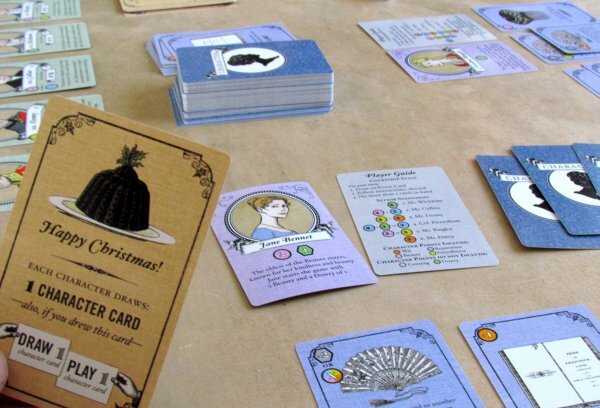 Players take turns until the moment, when package of events is emptied. Now is the time to get engaged. At this point, cunningness of girls decides about order, in which they choose suitors. 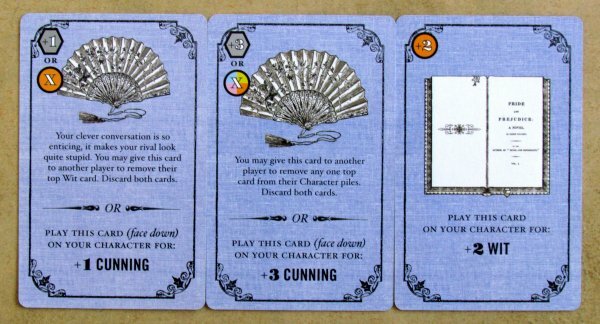 Cunning cards can be played secretly during the whole first phase. The subtlest begins and puts in front of herself all lords, whose standards she meets and sorts them according to numeric values from number one up. 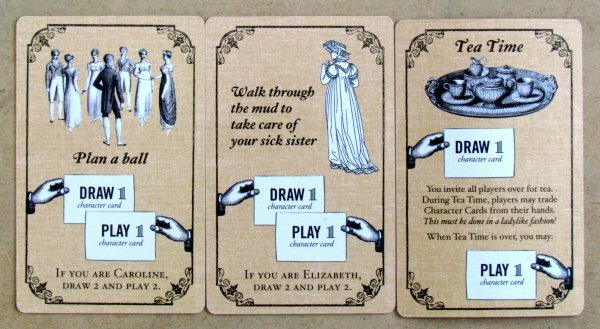 Entire series can then end by spinster card, if someone does not already have it. 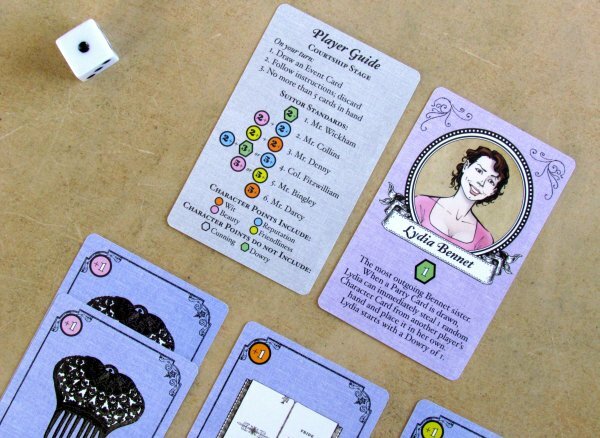 Then she gradually rolls dice for each applicant, who is interested in her. Only that one, who rolled number four and higher really proposed. But the final decision is, of course, up to the girl. She can also refuse and continue with next in line. Evaluation continues with the next character in sequence until she decides to marry someone or is left on the shelf. This roll of the dice is preceded by time for serious decision. In exchange for all those subsequent bonus rolls for all available suitors, girl can choose only one suitor, she is really interested in. But this failure immediately ends by spinster role and there is no chance to re-roll. Thus, all heroines have selected (or rejected) her suitor. According to identity of their new spouses, each player gets a certain number of points. 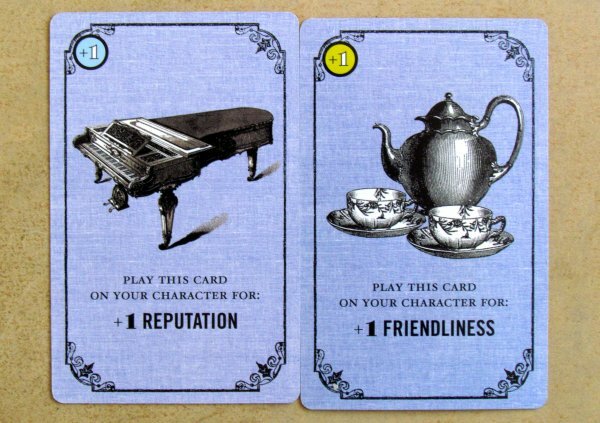 Among the added value are included also points for character cards. 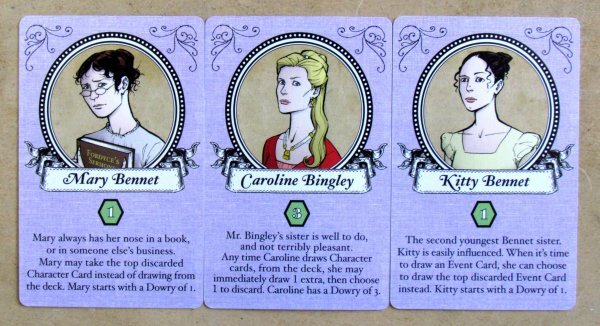 Only spinster card is evaluated differently. But in the end, winner is the player with the highest point gain. 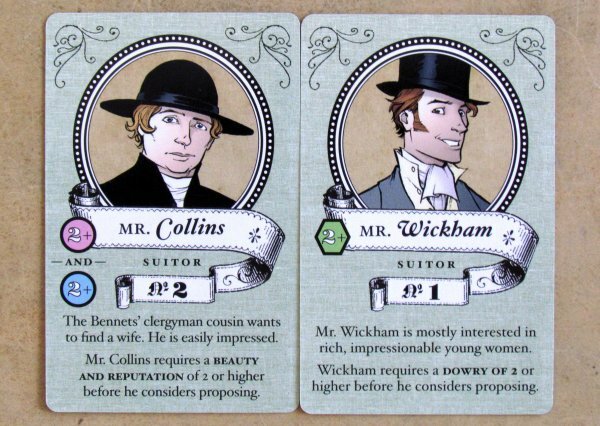 Marrying Mr. Darcy is an interesting card game, that has an interesting background RPG elements. Players can improve their heroines with a clear objective: to make her dream come true. Sometimes, this is not easy, because demands of some of the characters are quite high. Each character has clearly her own ranking. 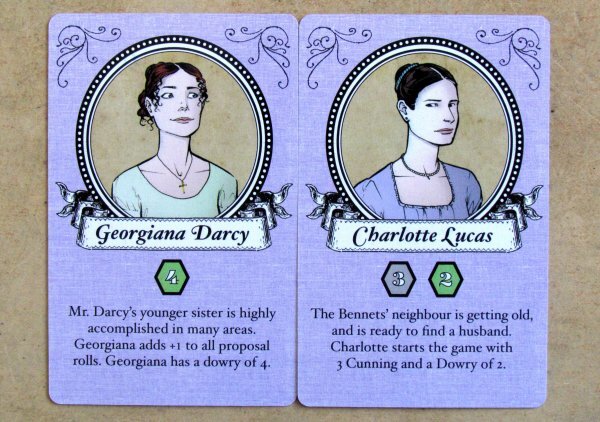 While each of them may marry almost any man (although Georgiana cannot be Darcy‘s), but only some of them are really happy marriages for them. And this equals to victory points awarded, which should be driving force for players from the beginning of the match. 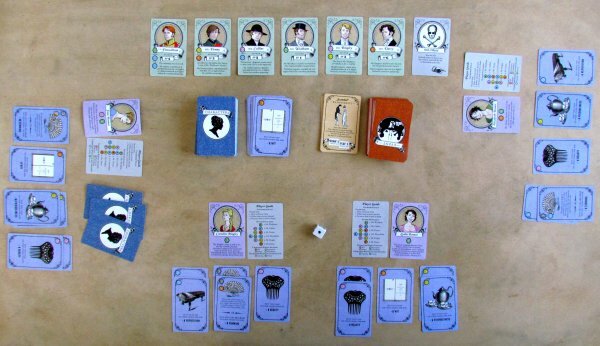 But also events extend the game and make interesting things, sometimes even otherwise clear violation of rules of the game (such as a second option to accept an offer of marriage for the groom, she already refused). 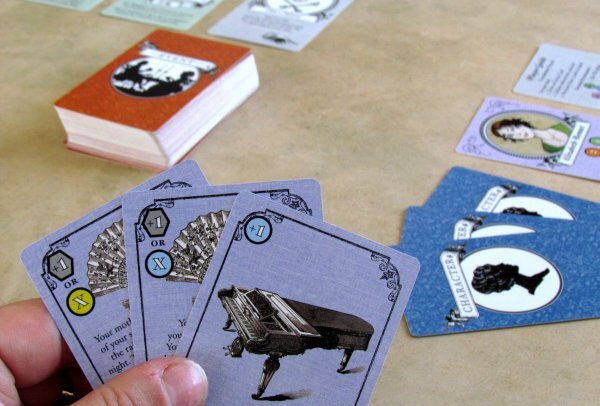 The cards have usually word OR on them, according to which players must decide, whether to use its action or draws a new card from the character deck instead. We like very much unconventional approach of the game. It is actually divided in two parts, but they are still linked together very well. 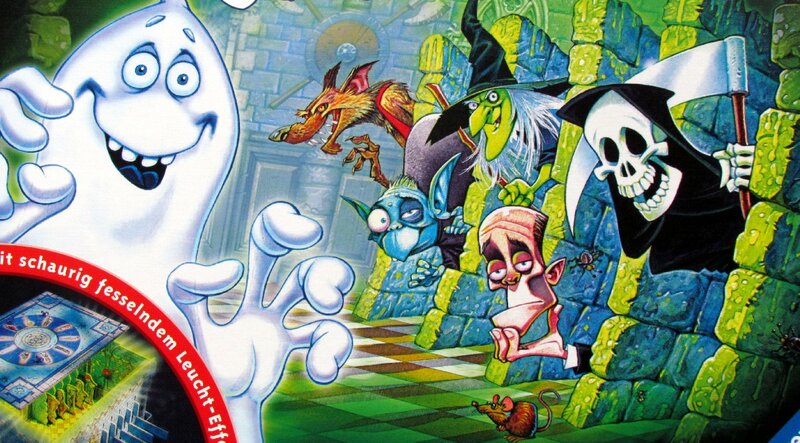 Whole game is very clever and offers very well done atmosphere. 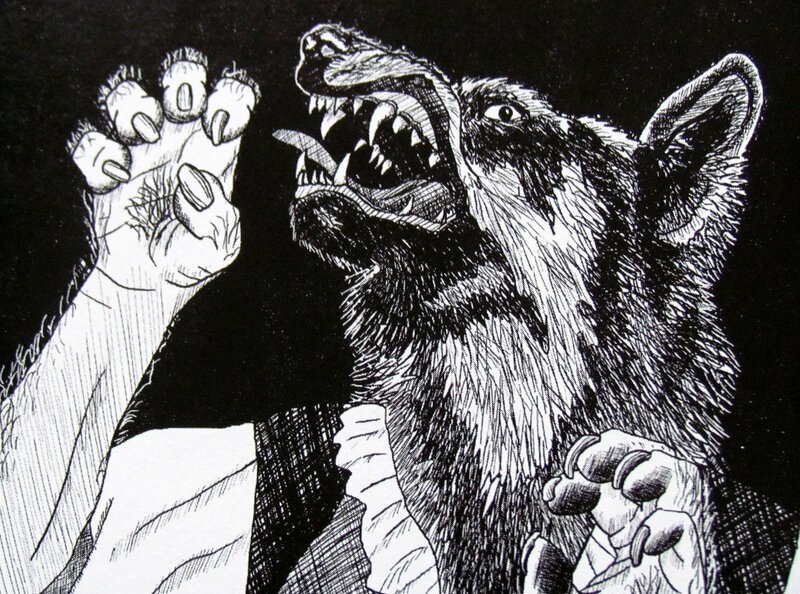 Theme is enriched by frequent quotations and great illustrations. 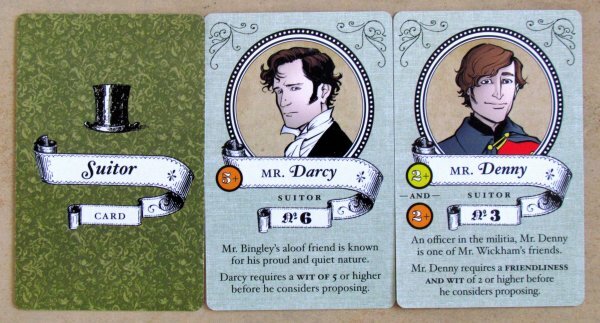 Lots of interesting and unexpected is in number of players, which can play Marrying Mr. Darcy. And this number starts with two. In doing so, you probably will be equally surprised, that even then, you still are having fun. Rivalry does not get any easier even then, because each player is also fighting with himself and his bad luck. Length of the game is then adjusted by amount of event cards, but you can never be quite sure, how long will a match take. But one hour is a good orientation point to start with. 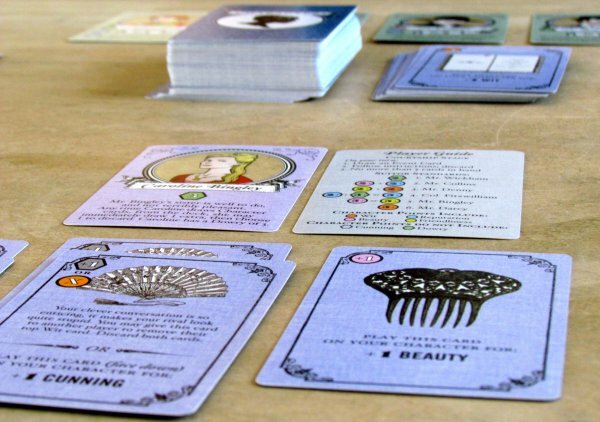 Although there is fixed number of heroines and suitors, each game feels a little different. 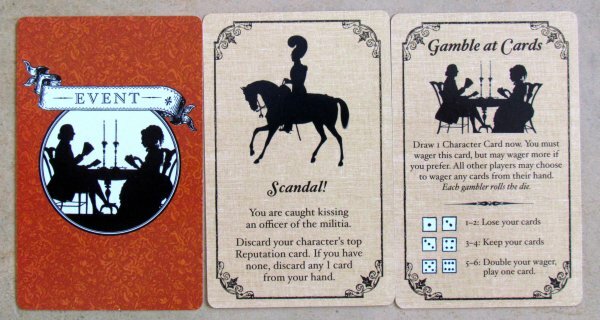 There is enough character cards and events to create a dynamic impression of the whole romantic adventure. In doing so, players quickly immerse themselves in their role and go for the jugular, like they really fought for suitors. Luck has clearly given place in the game. 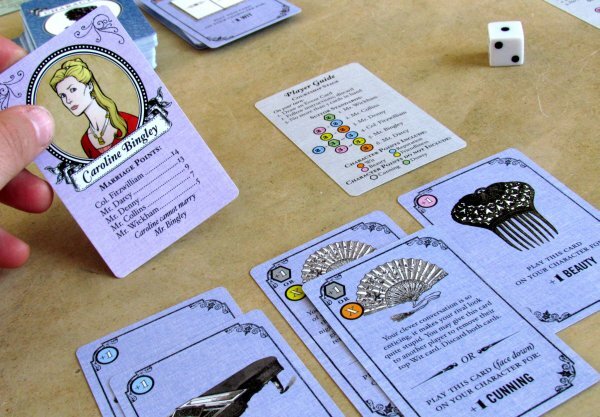 It all starts by drawing cards, that players need for their heroine. 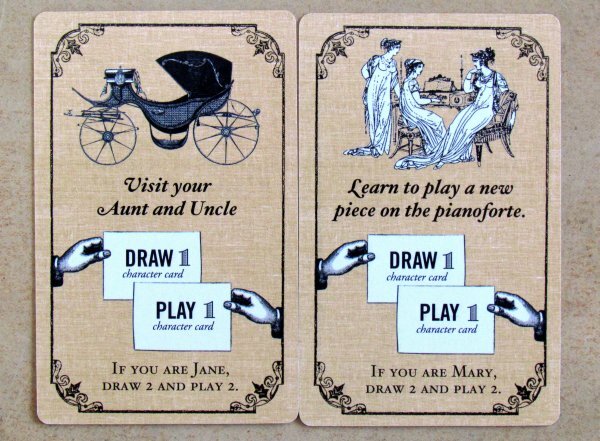 Here, however, a unique opportunity to select out of available four cards sets in and player can choose the one with best direction towards his education goal. 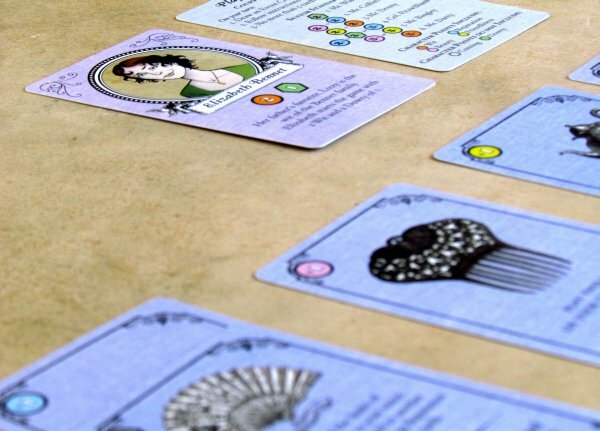 It is even possible at certain moments to even trade cards with others at a tea party. All you need is to play the right card. Pictures look like they literally jumped from pages of the book (or filmstrips). 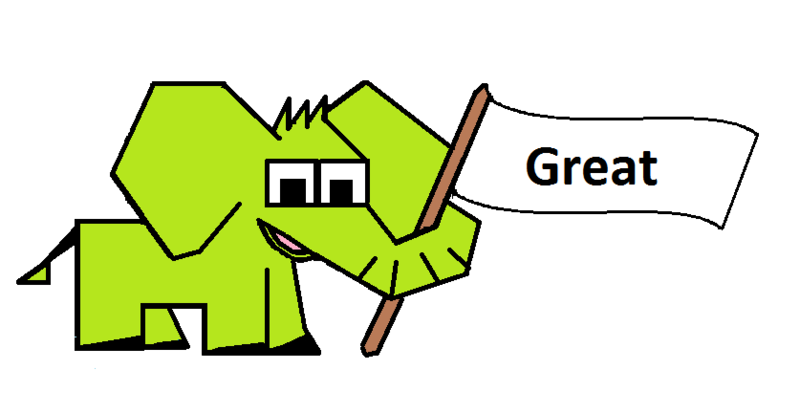 Amazing graphic processing is one of the keys to success. It is obvious, that the game was given maximum possible care and that money from the campaign were used well. 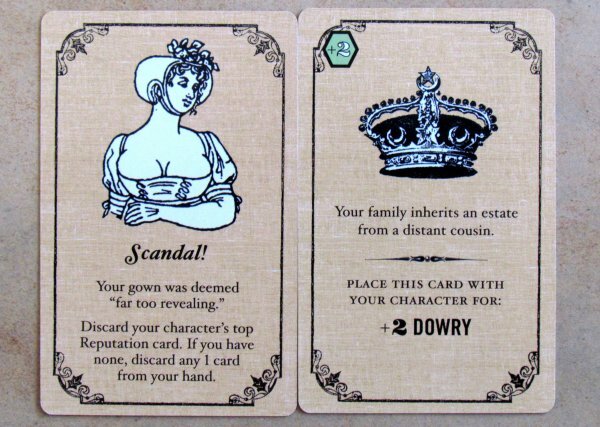 Some cards of scandal are truly unique and we do not want to spoil the surprise of discovering their abilities. 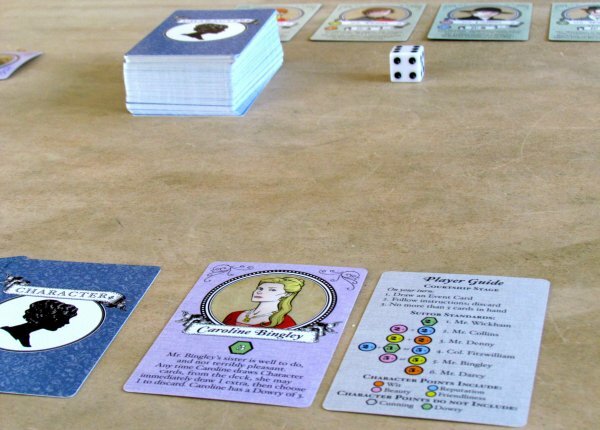 Marrying Mr. Darcy is a great card game, that is aimed primarily at women. You’ll notice, that the entire review was a little feminine conceived. The more surprising is, that game is fun even for male audience, that can try proposal out. It represents a unique gateway to the world of RPG games for people, who have always thought, that they will never level up their character (and we even did not mention a number of variants or even published zombie expansion!). 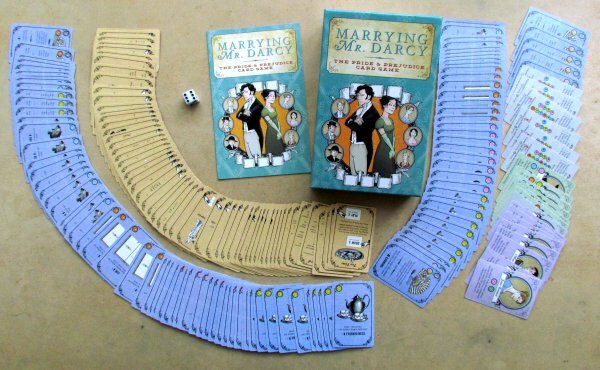 Marrying Mr. Darcy is an original card game for those, who simply love entertainment. 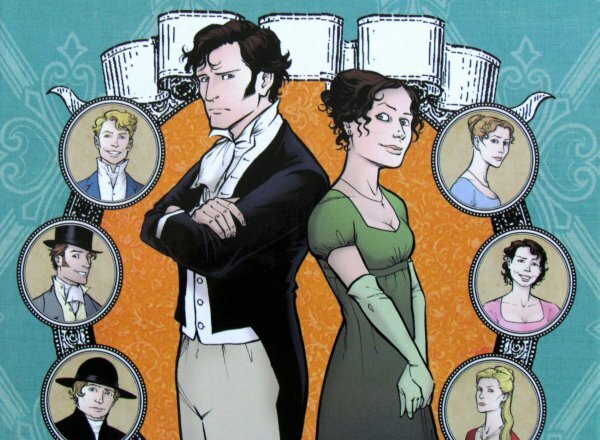 Citations from the book Pride and Prejudice by Jane Austen were used in the review. 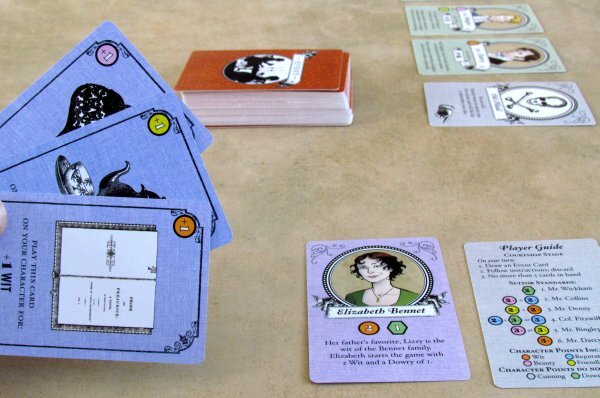 Marrying Mr. Darcy is a feather in the world of heavy and serious games. 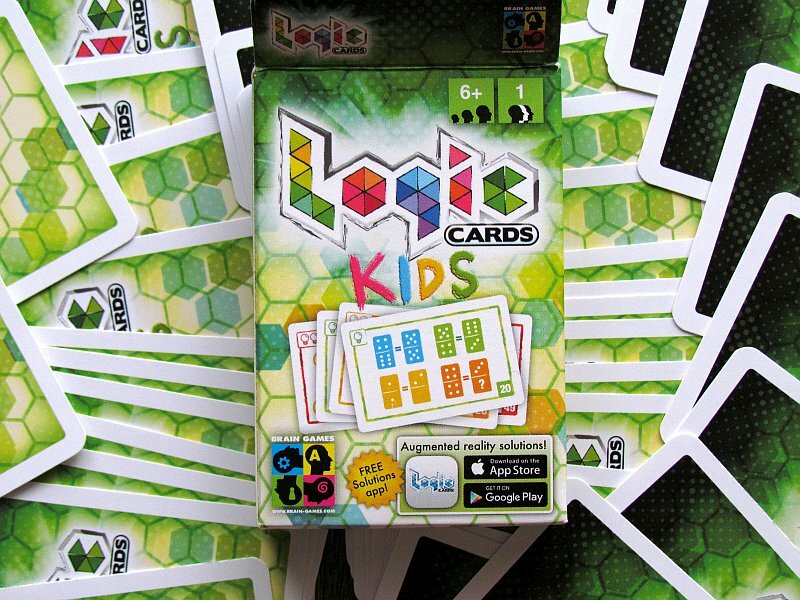 It has a wonderfully light gameplay, provides fun and amazing accessibility for all. However, in the interior of a simple mechanism, there are girl features, that have to gain interest of the suitors. But already first part of the match is far richer thanks to all event cards, that will amaze and entertain every contestant. 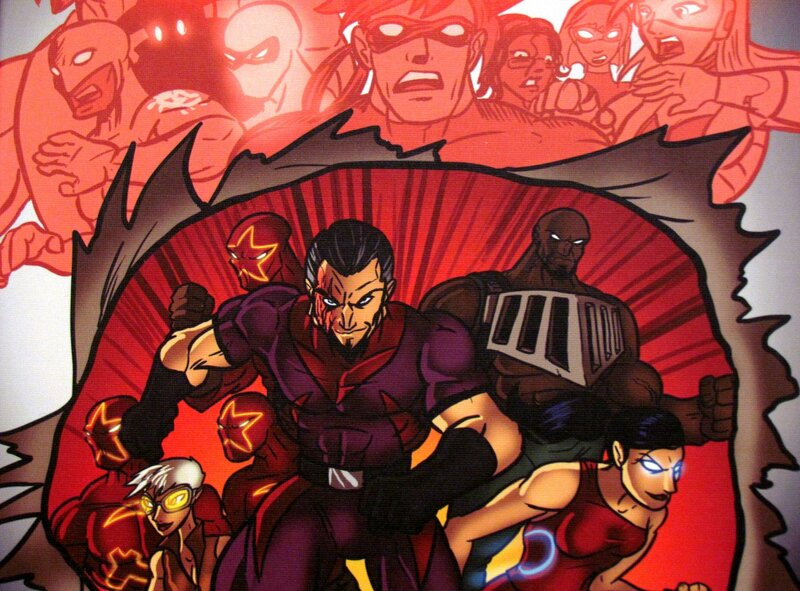 Another step forward is the game pushed by its theme and treatment, including detailed illustrations. Atmosphere is not spoiled even by a little luck, that accompanies the game, because the hour of the game time will run away so fast and is always a little different. Marrying Mr. Darcy benefits most from its originality and accessibility, because anyone, who really tries can now marry Mr. Darcy. Even a man.